‘Building Opinions: Eco Open Houses’ in Latest Homes, June 2013. 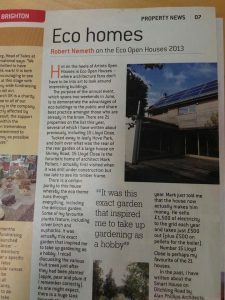 Columnist Robert Nemeth featured our award-winning zero-carbon house, which takes part in the annual Eco Open Houses show, in weekly free magazine Latest Homes. He writes a regular column called ‘Building Opinions’ where he showcases interesting architecture around Brighton and Hove. If you’re interested in learning more about this innovative eco-home and how it generates all its own energy, click here to download our free case study.